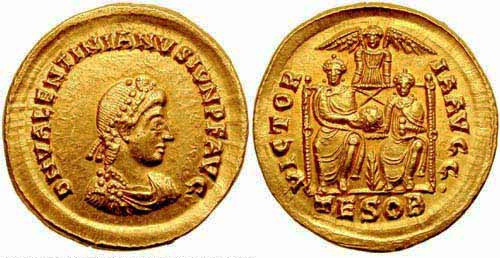 Flavius Valentinianus, younger son of Valentinian Ist was proclaimed Augustus by the army after his father's death. His elder brother Gratian, who had been proclaimed Augustus during the lifetime of their father, assented to the choice of the army, and a division of the West was made between the two brothers. Valentinian had italy, Illyricum and Africa. In 387 Valentinian was expelled from Italy by Maximus, and fled for refuge to Theodosius who defeated Maximus in 388 and restored Valentinian to his authority as Emperor of the West. Valentinian was murdered by the general Argobastes, who raised Eugenius to the throne. Obverse: D N VALENTINIANVS P F AVG, Diademed (pearls), draped and cuirassed bust right. Reverse: VICTORIAAVGG, in exergue: COM, Valentinian II and Theodosius I seated, facing, together holding globe over palm; Victory above and behind them. 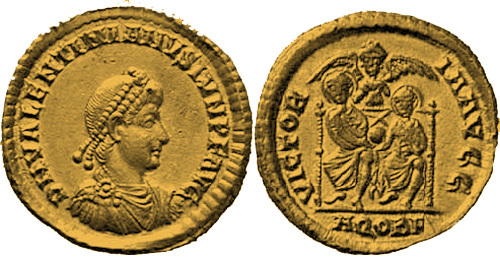 Reverse: VICTORIA AVGG., in exergue: SIROB, Valentinian II and Gratian seated, facing, together holding globe over palm; Victory above and between them. Obverse: D N VALENTINIANVS IVN P F AVG, Diademed (pearls), draped and cuirassed bust right. Reverse: VICTORIA AVGG., in exergue: TESOB, Valentinian II and Gratian seated, facing, together holding globe over palm; Victory above and between them. 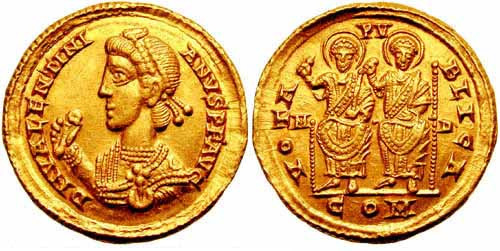 Reverse: VICTORIA AVGG, in exergue: TESOB, Valentinian II and Gratian seated, facing, together holding globe over palm; Victory above and between them. Reverse: VICTORIA AVGVSTORVM, in exergue: /ANOBI, Victory seated right, holding shield reading VOT/V. Obverse: D N VALENTINIANVS P F AVG, Diademed (rosettes), draped and cuirassed bust right. Reverse: CONCORDIA AVGGGG, in exergue: CONOB, Constantinopolis seated, facing, stepping on galley prow, holding scepter and globe. Reverse: CONCORDIA AVGGGGS, in exergue: CONOB, Constantinopolis seated, facing, stepping on galley prow, holding scepter and globe. Reverse: VICTORIA AVGG, in exergue: TROBT, Valentinian II and Gratian seated, facing, together holding globe over palm; Victory above and between them. Reverse: CONCORDIA AVGGGE, in exergue: CONOB, Constantinopolis seated, facing, stepping on galley prow, holding scepter and globe. Obverse: D N VALENTINIANVS P F AVG, Diademed, draped and cuirassed bust right. 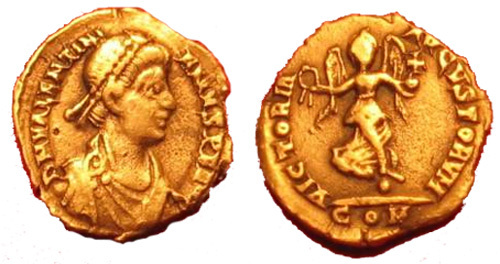 Reverse: VICTORIA AVGG, in exergue: T/R/COM, Valentinian II and Gratian seated, facing, together holding globe over palm; Victory above and between them. Obverse: D N VALENTINIANVS P F AVG, pearl diademed, draped and cuirassed bust right. Reverse: CONCOR-DIA AVGGG, Constantinopolis seated facing, head right, foot on prow, holding sceptre and globe; CONOB. Reverse: CONCORDI-A AVGGG Z, Constantinopolis enthroned facing, head right, right foot on prow, holding sceptre and globe; CONOB. Reverse: CONCORDI-A AVGGG, Constantinopolis enthroned facing, head right, right foot on prow, holding sceptre in right hand, globe in left; S//CONOB. Reverse: CONCORDI-A AVGGG, Constantinopolis enthroned facing, head right, holding sceptre and globe, right foot set on prow; E/CONOB. Reverse: VICTORIAAVGG., in exergue: TESOB, Valentinian II and Gratian seated, facing, together holding globe over palm; Victory above and between them.